Concealed carry for women can be a problematic task. Everyone woman that carries a weapon has struggled with where to hide it. There are several different choices and pros and cons to each. As a top tactical gear Orange County store we have a few tips on how to help your search. Having more than just one weapon for concealed carry will allow you to expand your wardrobe options dramatically. For example, a thin, small gun like the Ruger LC9 will give you more flexibility in concealing because it is flatter and thinner. However, a full-sized weapon with a little more punch like a Glock will limit your clothing options. Something else you want to consider is how you plan on carrying your weapon. If you plan on carrying in your purse you want to make sure there are additional safety features like grip and thumb safety on your gun so that it doesn’t accidentally go off. For instance, even though the Glock is a great weapon to carry on your person, it only has an external safety trigger that can accidentally go off if enough pressure is applied. There are many options out there but you want to find what works best for you. 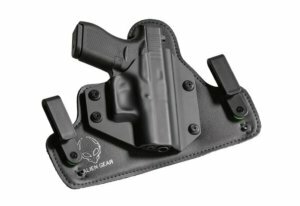 For functionality, you want to see if the holster is sturdy and how easily you can draw your weapon. Speed is essential, so you want to gain access to your weapon as quickly as possible. Take any physical limitations you might have into account. For example, if you have bad knees an ankle holster might not be the best option for you. Next, consider the safety of your weapon. You want to be able to draw your weapon without harming yourself or those around you. By practicing you can see if how fluid your motions are and improve if necessary. Lastly, you want to be comfortable with concealed carry. Different brands offer varying levels of comfort, so be sure to try a few before settling on one. Belly bands tend to be the most comfortable, with compression short holsters being another great option. You do not want to be forced to choose between wearing a fashionable article of clothing and leaving your gun at home. Therefore, to properly conceal your handgun on a regular basis, you will have to modify your wardrobe. Once you have decided what your carry method will be, start adapting your lifestyle choices and only purchase clothing that fits into that mold. LAX Ammo OC’s wide variety of high quality and affordably priced ammunition has allowed them to take Orange County’s ammunition market by a storm. Their friendly staff is trained to provide top quality service to all shooters, both new and experienced. They also carry an extensive line of tactical gear making them a top tactical gear Orange County store. Follow them on Facebook, Twitter, and Instagram to stay up to date with the latest news and sales. I like that you pointed out that the method of concealed carry that you wanted to learn should also be adapted into the style that you have or do. I just got curious about this because my best friend will be looking for this kind of program to learn the right method for her. It appears that she bought a gun because she was almost assaulted one time. Luckily, there were a lot of people in the area that night.